At Dusk All Cats Are Grey by Jerrard Tickell was first published in 1940 but it has been published as an e-book by Odyssey Press and when they asked me if I would like to review it I jumped at the chance as I’ve enjoyed reading some of his books in the past. This is yet another book set at the beginning of World War 2, I seem to have been reading so many of them recently, I suppose the novelists of the day felt the need to write about it and how it was affecting people. Joanna is the twenty-two year old daughter of Lady and Sir Robert Shirley. Sir Robert is a gentleman farmer in the Cotswolds but he is very poor and he is almost certainly going to have to sell off more land. Joanne decides it’s time she got out and earned a living. She has a rare talent (for a Brit anyway) in that she picks up languages very easily and as she has spent time in Austria and Germany skiing in the past she’s fluent in German. She gets a job in an advertising agency in London but while she is socialising in the city she meets up with Colonel Seymour who offers her an undercover job when he discovers that she can pass as a native German or Austrian. Joanne isn’t at all keen to spy on Austrian refugees as she is asked to, but with mayhem ensuing across Europe she’s only one of many who have to do things they would rather not. Of course there’s a lot more to the book than I’ve said, there’s also some romance thrown in. I’ve noticed that some other people who have reviewed this book have been disappointed that Tickell didn’t spell out exactly what Colonel Seymour’s department was up to. For me that just added to the authenticity because so many people were involved in ‘hush hush’ work, and at the time nobody questioned the fact that people couldn’t talk about the work they were doing. Walls have ears – as the slogan said. My thanks go to The Odyssey Press who provided me with a copy of this book for my Kindle. I enjoyed it a lot, although maybe not quite as much as Tickell’s Villa Mimosa, Appointment with Venus. 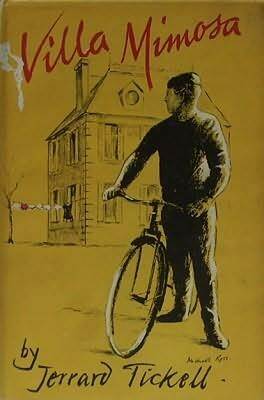 Villa Mimosa by Jerrard Tickell was first published in 1960 and the story is set mainly in France during World War II where Major Charles Addison is under cover as a watch-maker, using the alias Charles Bertin. When he is asked to mend a watch belonging to a German officer it gives him a chance to look around their headquarters. On his way back to the village he stumbles across a house called the Villa Mimosa and he discovers that it is inhabited by women who are there to serve the German officers. In his radio report back to London he mentions the existence of the house, suspecting that he should have kept his mouth shut about it and sure enough – he should have because London come up with a crazy plan to send men in to rescue the women, putting the lives of many British soldiers at risk. Jerrard Tickell was in the army during the war and I suspect that he felt the urge to write this book as he had witnessed many such pointless exercises in his time, dreamt up by those in London sitting safely behind desks and oblivious to the danger that they were putting others in. I enjoyed it although the whole premise is crazy. I had thought that I hadn’t read any other books by this author until I had a look at his Wiki and noticed that he wrote the biography of the British agent Odette which was made into a film. I read the book way back in the 1970s after having watched the film. He also wrote Appointment with Venus and A Day to Remember, both of which were made into films. You can have a look at his Fantastic Fiction page here.